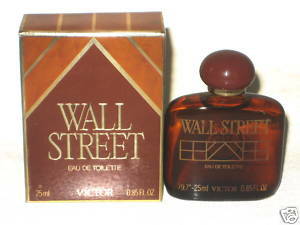 In the spirit of my recent decision to include reviews of discontinued fragrances, I present to you Wall Street by Victor. I'll obviously assume Victor axed this fragrance because it wasn't making money for them, so the question remains as to why it wasn't selling. I'm thinking it was due to Wall Street's shamelessly old school 80's style, which isn't exactly in synch with what's hip these days. Though I wouldn't really call Wall Street a powerhouse in terms of its strength, it's definitely got the smell of something Gordon Gekko would have worn back in the day. Many reviewers call this a cedar fragrance, but I think it's much more of a leather chypre scent for sure. It's rich, warm, heavy, brown-hued and leathery, with "1984" written all over it. Moss and leather are by far the strongest notes in this, and everything is rounded off with what smells like tobacco, honey and amber. Wall Street smells like a much smoother, less herbal Quorum, or simply a less loud version of Worth Pour Homme Haute Concentration. I prefer the aromatic blast of the Big Q to this, but Wall Street's smooth blending of moss and leather is so rich and velvety, it's irresistible. Many will consider Wall Street an outdated relic of the Eighties, but if you still love the old school fragrances from that decade like Gianfranco Ferre Man, Quorum or Fendi Uomo, you will love this, trust me.